Bossy Italian Wife : Hooray for Father's Day! By now you should all know how I feel about Hallmark holidays; I don't like them because we should be appreciating and celebrating the people in our lives all the time. However, today is Father's Day, and since I can't stop the commercial machine that has taken over the United States, I figured we'll just do this thing. I don't talk about my dad much on here, so you might not know a lot about him. My dad and I have a very special relationship and one that is fairly unique: we chose one another. At least, that is how we like to put it. My "dad" is not biologically related to me, but he's a dad in every other way that a dad should be. He was my mother's second husband, and even after their divorce over ten years ago, he has stayed in my life. (That is why we say we chose each other.) If you ask me, that takes a pretty exceptional guy. 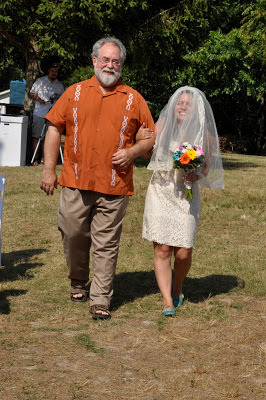 He walked me down the aisle at my wedding, we enjoy holidays and milestones together, and he gives me all the love and support that a dad should. I'm really lucky in this way because most gals whose biological fathers don't stick around may or may not get a second chance at having a father figure in their lives. In this way, I am extremely lucky and very thankful. In many ways my dad and I are very similar...we get one another, and have an easy relationship. Father's Day doesn't mean much to me because when you have a dad like my dad, you feel lucky each and every day. So dad: I hope you know that I love you every day. You've stuck with me through the wacky, the down right crazy, and the ugly, and you've always been really proud of me. You stepped up to the plate when I needed a dad, and I am happy every day to be your daughter. I would also like to take this time to apologize to my dad that there always seems to be a concert scheduled on Father's Day that I buy tickets to months in advance and then realize a month out that it falls on Father's Day....since he's a music fan like me, I am sure he doesn't hold it against me, but still.